Poseidon's Wake is set in the same universe as Reynolds previous two Poseidon's Children novels (Blue Rembered Earth and On the Steel Breeze) but is written as an informal conclusion to the trilogy, a book that works equally well as a stand-alone story. The story begins on Crucible, a distant planet from Earth that is now a colony for humankind. For Ndege Akinya Crucible has become a prison, held responsible for her part in the disaster that befell the transport vessel decades earlier. Then a signal is discovered from the distant star system Gliese 163, a message in Swahili which says simply "Send Nedge". Nedge however is now too old and frial to make such a journey across the stars and so her daughter Goma, Goma's wife Ru and Mposi go in her place. Across the Galaxy Kanu, another member of the Akinya family has also discovered the message and sets off with his one-time wife Nissa and AI friend Swift — believing their destination holds the key to understanding the mystery of the Watchkeepers. One of the things that really stands out with the Poseidon's Children series is that rather than go down the dystopia, apocalyptic or otherwise deteriorating future route the vast majority of 21st century science fiction novels seems to take, these books paint a much more optimistic view of humanities future. The series also partly addresses the need for treating people equally and this includes the use of "ve" as a nonbinary gender descriptor (first used by Greg Egan twenty years previously). That isn't to say that humanity has it easy or has solved all it's problems but things haven't got worse, just more complicated. Factions still disagree with others on the way things should be, to the point that they are willing to sacrifice their lives to prevent them achieving their goals. Humanity still has it's weaknesses even if they are no longer plagued by short life-span and gender and racial inequality. At times, Poseidon's Wake feels like a modern novel that still manages to retain that wonderful sense of a story created during the "golden age" of science fiction, full of big ideas and interesting characters. Reynolds spends a great deal of time on these characters — to the point that some of his ideas do seem to have less space to be explored than I'd have liked. There is also a big connection to the previous books that I feel any reader not having read them will miss out on, especially with the legacy of Eunice? and her Elephants. Part way through the book there is this big game-changing reveal that shakes things up but the reactions of the characters are less convincing than they could have been — especially given all that investment in their personalities. That isn't to say that this book doesn't work, because it does. 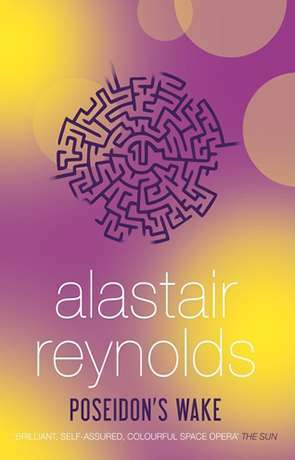 The main theme of intelligence not being restricted to the bipedal form is the big one and Reynolds manages to carry this idea across well. The story itself works, providing an intriguing glimpse into one possible future of the human race and a larger view of the universe and non-human life. I loved the way the author takes the sharp edges off "hard" science fiction and yet manages to retain the essence of what "hard" science fiction is. The scope of the series defines the term "epic" and yet also retains a sense of place, being told primarily from the viewpoint of just one family. Podeidon's Wake is a richly rewarding novel and worth the price alone just for the ending (and the big reveal). Reynolds continues to show just how talented and author he is. Written on 1st October 2015 by Ant.